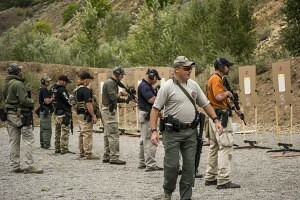 What Makes a Professional Firearms Instructor? Editor’s Note: Action Target has republished this article in its entirety with the permission of the author. Ideas, comments, practices, recommendations, etc. are the author’s own and do not necessarily represent those of Action Target. There are so many different types of “firearms instructors” that it’s virtually impossible to give a standardized answer to this question. In no way do I think I have all the answers to this question. The purpose of this article is to simply get instructors thinking about possible answers. Depending on the type of firearms instructor you are, your answers might be a little different. Just so we are all on the same page, a few examples of different types of instructors I’m referring to are hunter safety, trap, range safety, NRA, competition, defensive shooting, and tactical (law enforcement / military – life and death). There are a wide variety of training doctrines and techniques to choose from – I won’t talk about any of them. This article will focus on the different attributes that make up a professional firearms instructor. As I look at it, there are levels and stepping stones in your instructing career. Generally speaking, I would venture to say some of the best instructors have law enforcement (LE) and/or military backgrounds. However, I’m sure there are exceptions out there. The majority of my experience as a firearms instructor comes from the LE / military arenas. However, I do occasionally help out with hunter safety and even coach some trap. Over the years, I have tried to listen and learn from many colleagues and instructors. One of the first lessons I learned was that I don’t know everything. The first thing is to remember you can always learn something new. Never rest on your laurels, and always try to learn something that will make you a better instructor. Find a mentor or mentors and work on how you instruct. Every time I watch someone else teach, I’m trying to learn another way to communicate or relay information to the student. You can never stop learning and improving. I would never claim to be the best instructor, but looking back, I wasn’t a very strong instructor when I first started. In my opinion, there are a few areas that make or break you as a good, professional instructor. I’m going to break down and discuss a few of these. Since we are trying to define what a professional firearms instructor is, it seems the first place to start would be to discuss professionalism. As I said earlier, there are many types of instructors which will alter some of the requirements. To begin with, we owe it to our students and our industry to have a clean professional appearance and attire. If you’re honest with yourself, it’s hard to disagree with the idea of showing a professional appearance. It’s not difficult to wear a polo or other collared shirt. Wearing some sort of T-shirt or an untucked shirt just tells your students you’re sloppy and unprofessional. Professionalism also includes your documentation for the class. Every class needs a lesson plan and supporting documentation. Did you make a range safety plan and safety brief for your students and instructors? We can never afford to take safety for granted. Don’t cut corners or fall back on the “do what I say, not what I do” motto. Always set the example for your students. Be courteous and respectful to your students and other instructors. Never bash another instructor or their techniques – that just shows that you are unprofessional. Never contradict another instructor in front of students unless it deals with an immediate safety issue. During a break, take the instructor aside and privately discuss any difference or suggestions. I have already mentioned that you can always learn something new. To do that, you need to continually reevaluate yourself as a firearms instructor. I put a date on all of my police recruit / instructor manuals to require myself to reevaluate the techniques, tactics, and gear every two years. If you haven’t changed any of your curriculum in more than two years, you have most likely rested on your laurels and are now becoming a liability. Be open to evaluating different techniques. Just because an instructor has the most years of service behind his name, it doesn’t mean he is the best firearms instructor. This is especially true if there isn’t an open mind to progress and change. 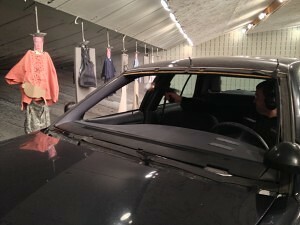 This area is critically important, especially for defensive and tactical firearms instructors. Realizing we need to keep an open mind about ourselves, we also need to keep an open mind about our techniques, tactics, and gear. As we look at new tactics, we always have to remember that some look really cool on a flat, sterile range when the students’ heart rates are low. Always evaluate the validity of a new tactic or piece of gear before you introduce it into the classroom. Will the technique work when the student performs it with an elevated heart rate? Far too often, I’ve seen an instructor show students a “cool” technique that doesn’t pass the common sense test. The worst thing a professional firearms instructor can do is to fail to vet a new technique, tactic, or piece of gear. Many times, I’ve watched an instructor go to a school or seminar, learn some new tactic, and come back to start teaching it as the “new coolest thing” in the world of shooting. Usually, within a few weeks or months, the instructor realizes the technique isn’t sound and may only work on flat, sterile ranges as opposed to real world situations. The problem is that the damage is already done. Every instructor is liable for what they have taught the students that have already completed the class. Good, professional instructors will vet any new technique before they go out and teach it to students. Consequently, they need to incorporate any changes into their lesson plans and stay consistent. Think about this: if you’re with a group of instructors evaluating different techniques or gear and you’re always the one talking or you’re never wrong, you just figured out the issue – it’s YOU! If you run the training, you have to remember a good leader always depends on others to make you look good. Once you think you know everything, you are doomed. It’s impossible for one person to know everything, and if you think you do and you’re always right, you are the liability for your training program. Most of this comes down to leaving your ego at home. Remember, story time reduces training time. As you update your curriculum, remember to have integrity. don’t take credit for other people’s work. Simply changing the name of a technique doesn’t make it yours, so don’t try to make a name for yourself that way. If you change the name of a technique, you will typically end up confusing your students anyway. This comes back to the ego again. The more you have to tell people how great you are, the more you are covering up your inabilities as an instructor or person. 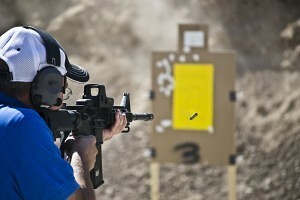 The most important thing a good firearms instructor can do is to help a student learn. Always remember, we must walk before we run. Breaking everything down into small tasks (modules) will go a long way to accomplish this goal. I still live by the old military adage we learned: KISS (Keep It Simple). We can drop off the last S. Trying to impress your students with big words only confuses the students and makes learning harder. There is no need to carry a dictionary on the range. It comes right back to the ego again. Students always need to have a positive learning experience. For example, when teaching some of the basic fundamentals of firearms, we need to understand why a student’s rounds are going to a certain location. A good instructor has learned how to break down the drills to help students learn why their rounds are always going to a certain place. Until a new instructor understands this, a simple shot analysis card can be an easy first step for learning. Do I have all the answers? Absolutely not. If I ever thought I did, I would be a liability to myself and others around me. Remember, the purpose of this article is simply to get instructors to think about what a professional firearms instructor is and then take the time to evaluate themselves and their curriculum. 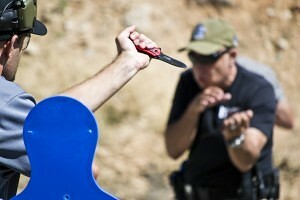 As for the idea of coming up with standards for firearms instructors, I don’t think it’s a very easy or feasible task. The biggest problem with this would be that there doesn’t seem to be a good clearinghouse to standardize a professional firearms instructor. Remember, as firearms instructors, our goals need to revolve around providing the best possible real world learning environment for our students. Teaching a student to shoot a firearm has a great deal of liability surrounding it. Having students use what they have learned from you in defense of their lives or another person’s life is forever rewarding. 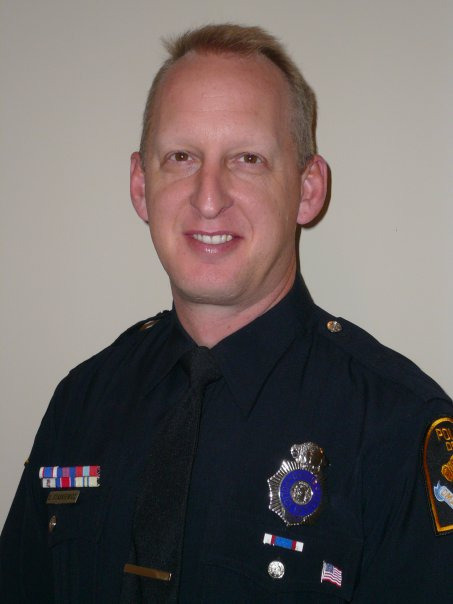 Officer Dave Staskiewicz is Range Master of the Omaha, Nebraska Police Department. 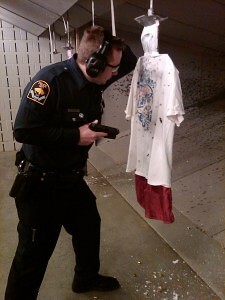 He serves as the lead firearms instructor as well as the lead Taser instructor. Dave can be reached at dstaskiewicz@ci.omaha.ne.us. Action Target’s annual Law Enforcement Training Camp ended Friday as instructors and trainees parted ways after another year of advanced firearms training. This year’s LETC was attended by 128 law enforcement officers and firearms instructors from across the country and the world. Nearly 20 states were represented with officers from Hawaii and California to Florida and Pennsylvania. While LETC is traditionally a domestic law enforcement camp, as its fame has spread throughout the world, we’ve increasingly received requests to attend from foreign law enforcement agencies. This year, 12 officers from Canada and one officer from Brazil attended as well. On Monday, Sept. 9, officers arrived at Action Target’s headquarters to sign in and pick up their gear which included personalized gun cases and water bottles. They were also able to tour the facilities where all of Action Target’s products are designed, engineered, and manufactured. 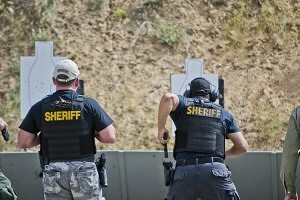 Classes started Tuesday morning at the Utah County Sheriff’s Office Thistle Firing Range. This year’s training classes included Bob Schneider’s Shoot House Training, James Washington’s Training for the Fight with the Pistol, a Glock armorer’s course, and many others. A total of 12 instructors participated from a variety of organizations including Spartan Tactical Training Group, Safariland Shooting School, Hoffners Training Academy, Glock Training Division, Police Training Division, JDS Tactical, and Clayton County Police Department. Some of the world’s finest law enforcement instructors teach at the camp every year. Firearms training professional Brian Hoffner, who has been an instructor at LETC nearly every year since the mid ’90s, encourages students to constantly learn more and to keep coming back to LETC every year. Wednesday night, more than 30 officers at the camp put their skills to the test in the Dirty Harry shooting competition as they vied for free tuition at next year’s LETC. Participants were required to shoot a variety of reactive steel targets while moving among three separate stations. The officer with the fastest time would win free tuition to LETC 2013 with second and third place winning significant tuition discounts. For the fifth year in a row, a law enforcement officer from Utah Highway Patrol won the competition showing that home court advantage has its benefits even when it comes to shooting. The classes themselves were anything but fun and games, however. LETC participant Dan Cord (who served in Fallujah, Iraq, before becoming the lead guitarist of the rock band American Hitmen) said he learned more in three days at the camp than he learned since joining the Marine Corps. The camp ended Friday afternoon with one final day of classes before attendees began their long journeys home to locations across the nation and the world. 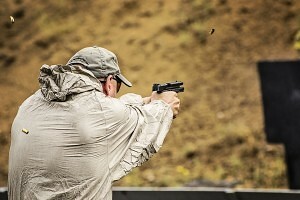 Much has been written about precision shooting in the world of combat skill development and pistol shooting in general. Perspectives and definitions of how and why we hit the intended target vary so greatly that two people involved in a heated discussion regarding precision shooting may be very parallel in their thinking, but they don’t recognize it. In this article, I will talk about how and why our views concerning this subject work. Ultimately, the goal is to bring us all a little closer in defining this controversial subject and understanding what we need to see in order to deliver a successful shot. All of my training methods stem from simplicity in firearms training. I like to cut through all of the fluff, and present concepts that make sense and are easily reproducible by the average shooter. Most of us subscribe to the age old premise that most likely originated with the invention of firearms in that the objective of shooting is hitting your target. Let’s start by discussing the two absolutes of hitting a target. They are muzzle management and trigger finger discipline. Since the bullet exits the muzzle on the way to the target, it seems likely that from zero to fifty yards (plus or minus), if the muzzle is pointed at the target when the bullet exits, then we will have ourselves a hit where we want it. 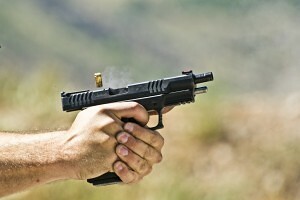 Trigger finger discipline refers to how we release the bullet toward the target. If you stabilize the muzzle of the pistol on the target and operate the trigger without disturbing that stability, you will experience success. Make sense? My students think so! Precision shooting is a total mystery to some simply because they are confused about what they must see to consistently hit the target. Sight alignment and sight picture are two regularly used terms in the precision shooting world, but they aren’t always fully understood. Sight alignment is nothing more than the front and rear sight as viewed by the eye. Perfect sight alignment is the front sight vertically and horizontally centered in the rear sight notch. 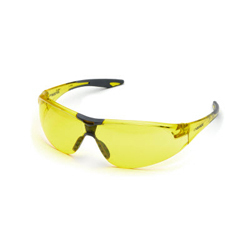 Sight picture is the target, front sight and rear sight as viewed by the eye. Perfect sight picture is the front sight centered vertically and horizontally in the rear sight notch superimposed on the desired point of impact of the target. In studying human vision, we find that the eye can clearly focus on a single plane, plus or minus an inch or two. Everything else ranges from a little to a lot out of focus. Relate this to a camera lens. The camera has clarity at its primary point of interest and everything closer or further away is less than perfectly clear. A little known fact is that the eye can pick the center of any object, regardless of its shape. It can do this without having total visual clarity of the object and can be accurate down to one minute of angle (a half inch circle at fifty yards). Now, let’s take a closer look at how and why precision shooting works. The muzzle of the pistol must be square with the target to hit the target. Think perpendicular with a very slight upward angle to account for the effects of gravity on the bullet, and horizontally centered. We use our sights as a guide to position the muzzle on the target. The more precisely we align our sights, the closer the muzzle is to square with the face of the target, and the more likely we will hit our desired point of impact, assuming that the pistol is already zeroed. The clear focus on the front sight as viewed through the slightly out of focus rear sight allows us the best chance to position the muzzle square to the target. The target should be out of focus, but its shape should be apparent. 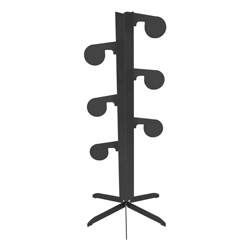 As stated above, the eye will automatically find the center of any object. What this boils down to is that precision sight alignment will square the muzzle (where the bullet exits the gun) on the center of the target, which our eye automatically finds, for a hit in the desired location. Bull’s-eye shooters that shoot the blank side of their target and shoot better groups than when they are shooting the target side prove the concept that the eye will naturally find the center of an object consistently. 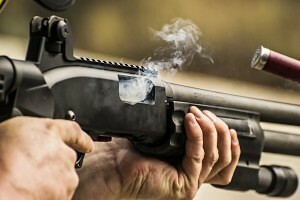 By keeping the eye focus on the sights through the release of the shot, the muzzle remains square with the target, and a consistent impact point is hit again and again. A simple and extremely effective sight picture that we developed for the aged-eye shooters (those in bi-focals and tri-focals) has become the standard sight picture for all of our students who aren’t happy with their present method of hitting the target where they want to. We recommend a dot on the front sight and the widest notch available for the type of rear sight to be used. This allows us to use the eye’s natural ability to center round objects in square openings with incredible precision. We zero the pistol for the strike of the round to hit whatever we put the front sight dot on, just as we would a red dot sight system. The regimen is to center the dot in the rear sight notch and float the dot on the target. With a smooth trigger press to release the shot, the thrill of a center hit is felt again and again. EDITOR’S NOTE: The views and opinions expressed in this article are those of the author and do not necessarily reflect the official position of Action Target as a company. George Harris has spent his entire adult life working in the world of firearms. For over 30 years he has been a successful and motivational educator and trainer in all aspects of small arms. 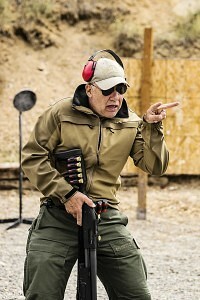 His simplistic approach to firearms training has an unarguable track record in extracting performance from his students of marksmanship, tactics, and maintenance. As a business developer in the firearms field, George co-founded the world renowned SIG Sauer Academy and led it to become a profit center before retiring after twenty-one years of service. George has the enviable record of leading industry test programs for multiple government and military agencies achieving successful results and contracts for firearms 100% of the time. Many of his innovations and ideas in firearms design features have evolved to production firearms improving function, ergonomics, and aesthetics. George has served as the subject matter expert involving firearms and related matters on television, radio, and in legal proceedings. Among his personal accomplishments, George earned the coveted U.S. Army Distinguished badges for both Service Pistol and Service Rifle. He also coached and was a firing team member of the World Champion U.S. Army Reserve International Combat Team before retiring with 40 years of continuous Military Service. Since it was founded in 1986, Action Target has had the pleasure of working with some of the greatest innovators in the industry from mechanical engineers to world-renowned law enforcement trainers. Each has left a unique impression and, in some cases, has even shaped the future of the company. One man who has played a significant role in influencing the culture of life-long training at Action Target is Clint Smith of Thunder Ranch. As a seasoned veteran and avid proponent of realistic scenario training, Clint has made a name for himself as one of the greatest firearms trainers in the world. This year marks 20 years of working closely with Action Target to create the most innovative and effective training methods available today. Clint’s natural ability to teach makes it seem almost effortless for him to convey difficult concepts to his students, but his experience is what has made him one of the greatest trainers in the world. Clint served two tours in Vietnam as a marine and worked in law enforcement from 1970 to 1980 as director of the firearms training division, S.W.A.T. team member, and precision rifleman. 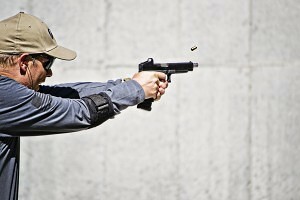 After leaving law enforcement, he entered the civilian arena as operations officer for the American Pistol Institute at Gunsite Academy where he was dean of instruction. Three years and several curriculum developments later, Clint decided to take his unique training techniques on the road as president of his own business called International Training Consultants. Before long, Clint’s portable training program was nationally recognized for innovative courses in urban rifle, shotgun, precision rifle, and various handgun formats. The more places he visited, the more popular his program became. All of the traveling eventually took its toll, however, and in 1992, Clint decided it was finally time to find a home. Along with settling down at a permanent facility, Clint’s training company also got a facelift. 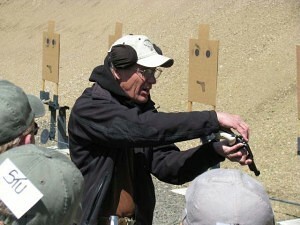 Clint Smith demonstrates a principle during one of his defensive revolver classes. “When we moved to Texas in the early ‘90s, we decided to update the name from International Training Consultants to something with more kick to it,” Clint said. “We had a popular training drill called Rolling Thunder, and since we’d settled on a ranch in Texas, we called it Thunder Ranch. Thunder Ranch officially opened in 1993 with five outdoor ranges including 300-yard and 1,000-yard rifle ranges, two classrooms, a computer controlled Hogan’s Alley nicknamed Thunderville, a four-story tower that housed additional indoor ranges, and two tactical shoot houses with movable walls. 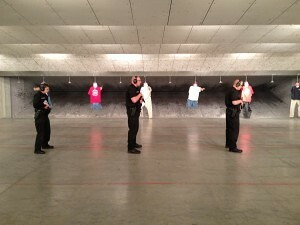 The program was set up with five-day courses on various firearms training techniques being offered to the general public. Word spread and before long, Thunder Ranch instructors were training 1,500 people a year. In addition to civilian courses, Thunder Ranch also accommodated the occasional specialty course for law enforcement. The ranch’s training facilities were put to the test in 1996 when Action Target held its annual Law Enforcement Training Camp at Thunder Ranch. More than 120 law enforcement officers descended on the ranch for an entire week of intense training and informative seminars. 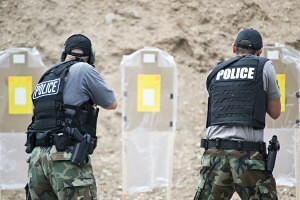 Nearly every aspect of law enforcement firearms training was covered from team tactics and police equipment to semiautomatic shotgun techniques and submachine gun deployment. Clint personally taught several of the courses along with other renowned law enforcement trainers. The 3D Target designed by Clint Smith continues to be one of the greatest training tools for charging and moving target drills. Less than a year after opening Thunder Ranch, Clint began working with Action Target to create new training products to meet the needs of his students including the Portable Bullet Trap and a reactive target system that was both affordable and realistic. He wanted to see how close he could take his students to a real life confrontation without actually putting anyone in danger. To do that, he needed a moving target that looked and reacted like a real threat. The solution was a 3D cardboard torso target made reactive through the use of balloons which could be blown up in the head, chest, or lower abdomen cavities. When inflated, the balloons put pressure on the steel rebar that runs through the middle of the target and hold it up by pressing against the sides of each of the three cavities. As soon as the balloons are popped, the target no longer has anything to hold it up and falls to the ground. Clint built a platform to house his new 3D Target training scenario with a PT Runner to add the realism of a charging or moving threat. No longer were his students just firing into an unreactive piece of paper, but they were firing at a moving target that looked and reacted like the real thing. As their heart rates and stress levels increased, students were forced to focus on their sights and aim for strategic kill zones. Shooting it anywhere wouldn’t bring it down, just like an actual assailant. 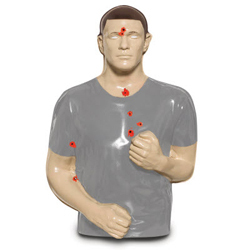 Inspired and designed by Clint Smith, the 3D Target has been an essential part of law enforcement training programs nationwide for nearly a decade. Clint continues to work with Action Target on new product developments and acts as a consultant to the company on training methods. 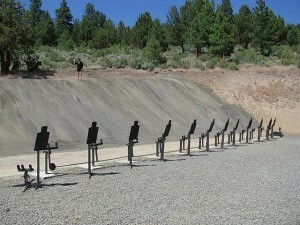 A shooting bay at Thunder Ranch equipped with a line of PT Torso steel targets and a moving target system provided by Action Target. Thunder Ranch remained in Waller, Texas, from 1993 until 2004 when operations were moved to southern Oregon. Clint Smith purchased 800 acres of land just outside of Lakeview and built brand new facilities from the ground up with equipment provided by Action Target. Though smaller, the new Thunder Ranch allows Clint to get back to doing what he loves. Courses are now only three days long and classes are smaller, but Thunder Ranch still boasts state-of-the-art training facilities and more than 400 trainees a year. Current classes include defensive handgun, urban rifle, team tactics, home and vehicle defense, mid range rifle, defensive concealed carry, high angle, and defensive revolver. Most classes have already been filled for the rest of the year. Action Target continues to support Clint Smith as a friend, and we hope for another 20 years of working with Thunder Ranch to bring superior training to law enforcement officers and civilians. 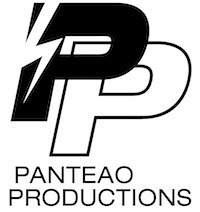 PROVO, Utah – March 7, 2013 – Panteao Productions announced that Action Target is now the video production company’s official target provider. Beginning immediately, all videos featuring firearms training on steel targets will exclusively feature Action Target products. 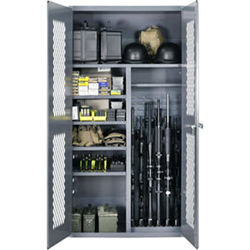 As the industry leader in instructional firearms videos, Panteao Productions needed a dependable target that could hold up to intense use while functioning safely. 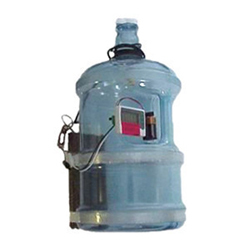 Panteao chose Action Target after putting several companies’ products to the test with its rigorous training courses. Panteao Productions currently has 45 instructional videos on everything from the combat mindset to the fundamentals of everyday carry taught by professional firearms trainers and military veterans. Panteao even provides an instructional video on how to capture shooting events on film taught by industry photographer Yamil Sued. 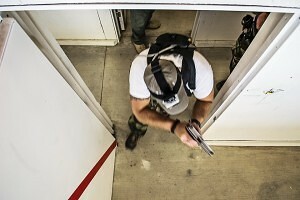 Panteao Production’s instructional line called Make Ready with the Experts, which often uses steel targets for training scenarios, is available for purchase online in DVD format or through a monthly subscription which allows unlimited video streaming on a computer or mobile device. As an official product provider of Panteao Productions, Action Target’s logo will be featured on the back of Panteao DVD cases and on its website as a sponsor. Action Target Inc. is a privately owned business headquartered in Provo, Utah. As the world leader in shooting range technology with more than 4,000 products and 40 patents for the systems it designs and manufacturers, Action Target has installed thousands of shooting ranges across the United States and in 25 other countries around the world. 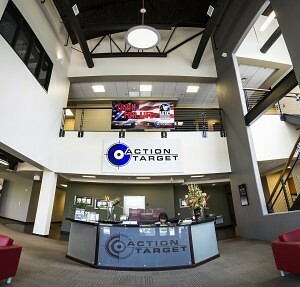 Action Target also designs systems and conducts firearms training for law enforcement and various military divisions. For more information on Action Target, visit www.ActionTarget.com. 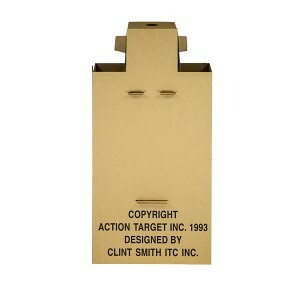 To learn more about Action Target products or to purchase items online, visit www.ShopActionTarget.com. Panteao Productions is a video production company based out of South Carolina that produces instructional videos from the top firearms instructors in the world. For more information about Panteao, visit www.PanteaoProductions.com. You can find Panteao on both Twitter and Facebook.